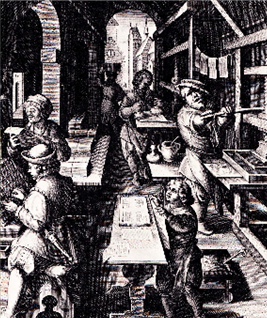 French historians Lucien Febvre and Henri-Jean Martin write about the social impact of the coming of printing and the culture of the book. About the year 1450 some rather unusual ‘manuscripts’ made their appearance in the northern regions of Western Europe. Although not very different in appearance from traditional manuscripts, they were ‘impressed’ on paper, sometimes on vellum, with the mechanical aid of a printing press which used moveable type. The process was simple. But it was the object of considerable curiosity and fascination. In fact, these new books were to cause profound changes not only in the habits of thought but also in the working conditions of secular and religious scholars, the great readers of the time. The changes (we won’t say revolution) soon broke the bounds of this original audience and made considerable impact on the world outside. …. Some 30,000-35,000 different editions printed between 1450 and 1500 have survived, representing 10,000-15,000 different texts, and if we were to take into account those which have not survived, the figures would perhaps be much larger. Assuming an average print run to be no greater than 500, then about 20 million books were printed before 1500, an impressive total even by 20th-century standards, and even more so when we remember that the Europe of that day was far less populous than now. There were certainly fewer than100 million inhabitants in the countries where printing developed, and of them only a minority could read. Although printing certainly helped scholars in some fields, on the whole it could not be said to have hastened the acceptance of new ideas or knowledge. In fact, by popularising long cherished beliefs, strengthening traditional prejudices and giving authority to seductive fallacies, it could even be said to have represented an obstacle to the acceptance of many new views. Even after new discoveries were made they tended to be ignored and reliance continued to be placed in conventional authorities. This is perhaps most strikingly revealed by a study of general attitudes in the 16th century towards the geographical discoveries and the imperial conquests outside Europe which were to have a profound influence on daily life, an influence whose significance and cause the public was slow to appreciate. [P]rinting … helped mould our modern European languages. Until the beginning of the 16th century the national languages of Western Europe, which had developed as written languages at different dates in different countries, had continued to evolve, following closely the development of the spoken language. For this reason, the French of the Chansons de Geste, for example, in the 12th century differs greatly from that written by Villon in the 15th. In the 16th century such developments began to cease to take place, and by 17th century languages in Europe had generally assumed their modern forms. At the same time, some written languages of the Middle Ages disappeared or were henceforth used more and more rarely for written as opposed to spoken communication. Provencal is one instance, Irish another. Finally, Latin was used less frequently and little by little it became a dead language. Starting in the second quarter of the century, grammars of the German language, a subject which had previously been scarcely studied at all, began to appear.